From ‘Serena-gate’ to Jack Sock (fittingly) claiming the men’s title, this year’s Auckland Open (ASB Classic – men’s and women’s) served up plenty of drama. While some sports may struggle to put bums on seats, or satisfy palates of fans in the stands, the Classic has been routinely netting first rate financial returns. By providing a satisfying experience for players, sponsors and fans, tournament director, Karl Budge, is tasked with ensuring Tennis Auckland’s cash cow continues to make with the milk. “I don’t want to compare our tournaments to just any other international; I want to compare them to Wimbledon. If we do that, the rest will take care of itself. We’re leading the women’s tour and we’re right up there with the men’s in terms of how to run a successful, modern tournament – that’s what gets me out of bed in the morning. Karl expects this year’s Classic will deliver its best ever returns, netting approximately $2.5 million. Although many top seeds (including the Williams sisters), failed to fire, he believes they were as successful on court as in the counting house. “No one thought Serena or Venus Williams would ever play in New Zealand… Christ, we had the women’s world number one playing here, that’s pretty phenomenal! If we could go back to January and know how it was going to play out [with Serena knocked out in the second round] wouldn’t you take it? Of course you would! Karl has a point. If the world’s best always won, sport would be pretty damn boring! With regards to the Williams sisters’ controversial hotel bill – reported at more than $30,000 – Karl says, thanks to contra agreements, Tennis Auckland’s net cash contribution was insignificant. To further ‘square the ledger’, he asserts Serena’s remarks about windy weather – experienced during her notorious second round defeat – resulted more from disappointment in her own game. “It was just a case of a player being pissed off and lashing out… she lost a match that she knew she shouldn’t have. I’m sure Serena will remember that wind for as long as she lives, but weather’s weather and she won’t hold that against us,” he says. And, with plans for a new stadium featuring a retractable roof underway, the prospect of attracting stars in the future looks good. To a certain extent, Karl’s role requires he play nursemaid to the stars. But supplying a certain type of water or chicken soup (or even a karaoke machine for Serena!) is a small price to pay to ensure they’ll return to play another day. The Classic’s success stands in stark contrast to New Zealand’s low club numbers. And, at the highest level, Marina Erakovic alone is the only Kiwi close to cracking the world’s top 100. Encouraging youngsters to kick the football into touch and pick up a racket is “critical” to the success of tennis in New Zealand, he believes. By serving as a shop window for tennis, the ASB Classic is bringing “everyone’s second-favourite sport” to the fore in our own backyard, Karl contends. “I’m a dollars and cents guy. It’s not strictly that un-emotive, but these tournaments are our biggest fundraising tools… to some extent, I measure my success by how much we generate. 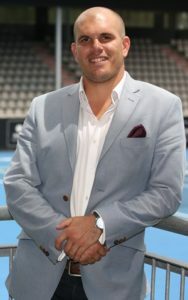 Karl Budge has negotiated the corporate ladder with aplomb rising to manage one of New Zealand’s premier sports events. While I’ll leave the details to his future biographer to divulge, suffice it to say that he has worked in a variety of roles around the world, with the WTA (Women’s Tennis Association), the Australian Open and the Oceania Football Confederation, to name a few. Today, with five ASB Classics under his belt, Karl’s more settled.